When it comes to a player as uniquely accomplished and as insatiably in demand as Brady, 15 months with no licensed certified autographs can seem like an eternity. But when Panini America’s 2018 Certified Football arrives at Sports Cards Plus, a.k.a. The Super Hit Factory on July 25th, the “long” wait comes to an end. FIRST PERSON TO PULL A 2018 CERTIFIED FOOTBALL TOM BRADY AUTO IN OUR STORE WINS $100.00 AT SPORTS CARDS PLUS. There is collecting comfort in the every-year certainty of a product as tried and as true as Panini America’s Certified Football. Year in and year out Certified Football delivers an array of calling cards that have been pursued passionately in some form for more than two decades. It is bolstered by that backdrop that Panini America Product Development officials are preparing the colorful, content-rich 2018 Certified Football for release. 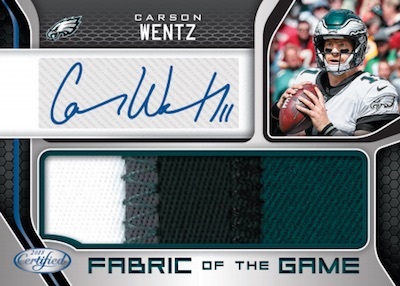 2018 Certified Football will deliver, on average, four autograph or memorabilia cards (including at least one Freshman Fabric Signature (autograph) in every hobby box (five cards per pack, 10 packs per box). The highlights of 2018 Certified Football are many and include . . .
A rainbow array of colorful base parallels to chase including Mirror (numbered to 499), Mirror Orange (numbered to 225), Mirror Red (numbered to 99), Mirror Blue (numbered to 50), Mirror Gold (numbered to 25), Mirror Purple (numbered to 10), Mirror Green (numbered to five) and Mirror Black 1/1s. 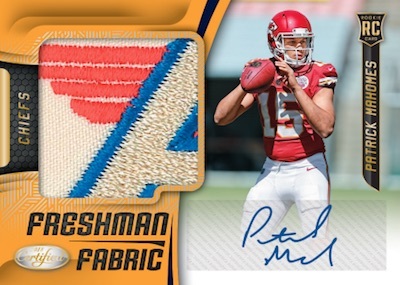 Freshman Fabric Signatures cards feature jumbo swatches and short-printed parallels including rare NFL Shields. New for 2018, find micro-etched parallels of Freshman Fabric Signatures, Rookies Auto, Gold Team and Gold Team Signatures. Oversized-patch autograph cards of veteran stars in Fabric of the Game Signatures (numbered to 99 or less); look for Prime versions numbered to 49 or less. Rookie Roll Call Signatures (numbered to 99 or less) of the top rookies from the 2018 NFL Draft Class in a variety of collectible forms including Red (numbered to 75 or less), Blue (numbered to 50 or less) Gold (numbered to 25 or less), Purple (numbered to 10 or less), Green (numbered to five or less) and Black 1/1s.